Fall is here and soon the holidays will be approaching, and what Seekender doesn’t like taking a weekend trip to view the fall foliage? One of the most perfect places to see those autumn colors is the Smoky Mountains. We recently were added to the Ultimate Seekender team and went on a lovely weekend adventure to Pigeon Forge, Tennessee. We loved the beautiful Smoky Mountain scenery coupled with all the amazing activities both in Pigeon Forge and nearby Gatlinburg. Though we only had two full days there, I was amazed at what we were able to see and do in just 48 hours. So I thought I’d share some of our favorite things to do in the Smoky Mountains with kids, plus some of what we hope to visit again someday! Here’s a video recap of our awesome Seekender trip. And you can read our top things to do in the Smokies below! 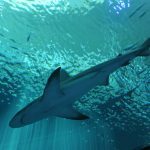 No trip to Gatlinburg with kids is complete without a visit to this awesome aquarium! The kids loved going through a tunnel of sharks and actually going inside some of the fish tanks! The array of fish and sealife was really spectacular, including the penguins and jelly fish. We had heard pancakes were a thing in Tennessee, but were shocked to see so many places in and around town. One that we heard about over and over again was the Pancake Pantry in Gatlinburg. I mean come on…what kid wouldn’t love M & M’s on their pancakes?! The food was really delish and the menu choices were awesome! I could eat there every day…if I didn’t care if my clothes fit! The reason we went to the mountains was for the outdoor activities! Sure there are tons of other things to do between Gatlinburg and Pigeon Forge, but we love to hike, take pictures, and enjoy the outdoors. We were lucky some friends met us while we were there! 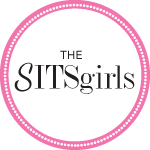 Check out Keith and Tia Sims blog Soulful RV Family too! My favorite part of the hike was when our daughter’s asked us what a pine cone was. Not in South Florida anymore folks! Brave girl in the chilly water on our float trip! Every trip to the mountains needs to include a little white water rafting. Our kids are little, so we opted for a float trip! It was super fun, except our littlest fell asleep. Glad we captured it in the video above! We really wanted to go to the famed theme park, but our girls are in a “I’m scared of rides” mode. I’ve heard it’s great though from our friends Michelle and Kira over at Sunshine & Hurricanes, check out their review! Next time we are totally heading to Dollywood! One of our favorite places was the brand new outdoor entertainment complex called The Island which was just across the street from our Hampton by Hilton. It had amazing restaurants, rides (like the air conditioned ferris wheel! ), carnival style games and a musical choreographed water show. (Think the Bellagio fountains at Vegas but on a smaller scale.) This is a great place to go around 4:00pm in the afternoon to play a bit and then catch dinner. A must do in the Smokies for sure! If you have the time and money to spend, there are several options to head up to the top of the mountains in a gondola or chair lift. After we had brunch at the Pancake Pantry, we hiked up main street to the Sky Lift and took a chair lift to the top! The view is spectacular! want to win a free seekender getaway?! 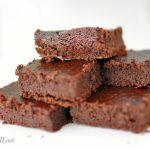 And if that doesn’t get you jazzed to become a Seekender, this giveaway might rock your world! 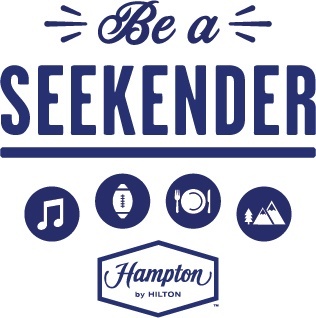 Hampton by Hilton has just announced the Ultimate Seekender Getaway Sweepstakes! The brand is rewarding one lucky winner with the opportunity to enjoy an all-expenses paid weekend experience to the destination of their choice with accommodations at a Hampton by Hilton property. Through Oct. 18, Hampton by Hilton is inviting participants to post their best Seekender-inspired picture on Instagram or Twitter using the #WeGoTogether and #SweepstakesEntry hashtags. Whether sharing a first-time experience, sampling an exciting new restaurant, or braving a new outdoor adventure, photos should capture the essence of the Seekender personality who always seizes the weekend to explore. One lucky winner will be selected for a weekend trip to a Hampton by Hilton hotel destination on Oct. 27. The grand prize winner will be awarded roundtrip airfare for him/herself and up to three guests, a complimentary stay at a Hampton by Hilton location of their choice, and spending money for food, activities, transportation, etc. So what are you waiting for? Start Tweeting and Instagramming and win that trip! And if you need more info about the Sweepstakes you can check out the Hampton Seekender site. Good luck! TOO cute! It looks like you guys had a blast!! Looks like an awesome trip! You guys packed a lot into those two days!! Thanks so much for including us! Great post and looks like you had fun. This looks like it was a perfect trip! I love the video and your daughters are so cute!! You guys definitely made the most of that trip! What a great experience and an awesome giveaway! My husband’s parents retired to that area (closer to Cumberland Gap), and we visit at least twice a year. Would you believe I have never been to Dollywood or Gatlinburg? Seriously. I need go. Thanks for the tips and the pics. So much fun! White water rafting too! I would love to visit there some day. My husband served a 2 year mission in that area and that is one of the places he wants us to visit as a family. Wow. The scenery is so beautiful. And of course, the pancakes look pretty good, too. Sounds like so much fun and I’d love to win a Hamptons vaca, too. I’d go just for the M&M pancakes at Pancake Pantry! The bald eagle roller coaster is also a perk. Honestly, though – it’s a life dream to drive through all the mountains in the Smoky Mountains. I really think that dream is calling to me soon. Your girls are so adorable! I know my girls would go absolutely nuts for M&Ms on their pancakes. And now I want to take a trip to the mountains to see some fall foliage, too! looks so fun! you seem happy (and healthy!!!!!) yay! I have never been to the Smoky Mountains but it has long been on my list of places to go. I love the outdoors and it is so good to get the kids away from the electronics for a few. I can’t believe how much FUN you packed in!! !